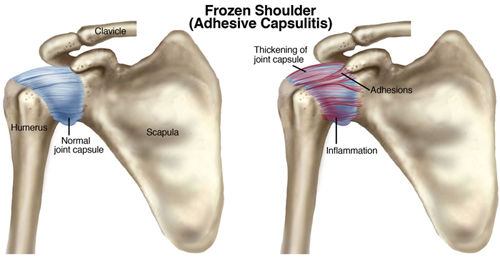 Adhesive capsulitis, commonly known as frozen shoulder, is a painful condition. It causes stiffness that can worsen to the point that moving the shoulder becomes difficult. Frozen shoulder is most frequently diagnosed in patients between 40 and 60 years of age. It is seen more often in women than men. Connective tissue called the shoulder capsule surrounds the joint. When the capsule thickens and tightens, inflammation occurs. Inflexible adhesions develop, limiting the shoulder’s range of motion. The first sign of frozen shoulder or adhesive capsulitis is shoulder pain that gradually becomes more severe and limits mobility. Patients describe the initial pain as a dull ache, generally in the outer shoulder and possibly in the upper arm. The discomfort increases over time, with the most extreme pain occurring during arm movements. This stage usually lasts between six weeks and nine months. Next comes the “frozen” stage, during which pain levels may vary but the stiffness is constant. Regular, every-day activities can become challenging during this four- to six-month period. Surgery is an option when nonoperative treatments fail to provide pain relief and restore shoulder function. Patients are advised to engage in conservative treatments for six months before considering surgery. They should wait until inflammation has subsided to the point that pain occurs only at the extremes of the shoulder’s range of motion. Undergoing surgery before then may result in capsular injury and reduced mobility. Procedures to treat frozen shoulder come in two flavors: closed and open. Closed procedure is called manipulation under anesthesia. The open procedures is done with either arthroscopic technique or traditional open incision surgery. Closed manipulation for frozen shoulder is typically recommended for patients diagnosed with refractory primary adhesive capsulitis. This method also may benefit those who suffer extreme motion loss following an injury or surgery, and do not respond to nonoperative treatments. An open procedure (arthroscopic or traditional incision) is required when a surgeon suspects that a patient has an extra-articular contracture or an internal abnormality in shoulder. Patients undergoing closed manipulation generally undergo deep sedation. An interscalene block with a long-lasting agent is often administered by injection or catheter. The closed manipulation procedure features the surgeon using one hand to stabilize the scapula, while the other hand holds the patient’s humerus (just above the elbow). The arm is rotated at the side of the patient’s torso with firm but gradual pressure, enabling greater range of shoulder motion. The surgeon can feel and hear soft tissues giving away to allow the increased mobility. This technique breaks up the scar tissue that would otherwise take physical therapy months to stretch out or unable to stretch out. To prevent fractures and other injuries, a surgeon first examines a patient (under anesthesia) to discern the ranges of motion in the operative and unaffected shoulders. This helps avoid potentially damaging over-manipulation. Arthroscopic release is the most frequently used method for treating frozen shoulder when closed manipulation does not restore flexibility. Some authorities question its diagnostic and therapeutic benefits. Others believe the minimally invasive procedure is an effective way to identify pathologic changes, observe the effects of previous closed manipulation, treat intra-articular and subacromial diseases, and detect other problems. Arthroscopically releasing the capsule before doing closed manipulation decreases the force needed to rotate the shoulder. General anesthesia is required for arthroscopic release and open release. Arthroscopic capsular release requires the use of an electric cautery to debride and cut through the tissue of the anterior, inferior, and posterior capsule. In addition the rotator interval is debrided. One must pay attention to avoid injury to the axillary nerve while cutting the inferior capsule. Open capsular release, while rarely recommended for most patients because of the risk of complications, is sometimes useful for those who experience extreme mobility loss in their shoulders as a result of head injuries or strokes. The procedure also has helped some postsurgical patients who have scarring and contractures that prevent the use of arthroscopic release. This invasive technique involves an incision in the shoulder’s deltopectoral groove. The surgeon dissects the deltopectoral interval, then releases adhesions between the deltoid and humerus by internally rotating the arm while retracting the deltoid muscle. This is a delicate procedure, because the axillary nerve can easily be damaged in the process. Care also must be taken to avoid retracting the deltoid too aggressively, which may injure the muscle. The next step in open-release surgery is to remove the coracoacromial ligament, and release scar adhesions between the rotator cuff and acromion. The conjoined tendon is excised from the scarred area, connected to the subscapularis and retracted; without affecting the musculocutaneous nerve. The shoulder is gently manipulated as the dissection advances from superficial to deep-tissue layers. If scarring severely limits the shoulder’s range of motion, the subscapularis may need to be split to release adhesions between the tendon and capsule. Another technique is to use coronal Z-plasty to lengthen the tendon and capsule. Prognosis section The pain and lost range of motion resulting from frozen shoulder or adhesive capsulitis generally subside within 18 to 24 months. For some patients, it takes as long as 42 months for their shoulders’ mobility to return. Most people eventually regain the ability to fully rotate their shoulders. Between 10 and 15 percent, however, continue to experience pain and limited motion. Some people’s conditions show improvement as long as 10 years after their symptoms initially appear. Patients rarely regress, according to researchers who found that recurrences of frozen shoulder are rare. Though many people have some residual loss of motion for a number of years following the onset of symptoms, most do not continue to report significant pain or loss of function. Multiple studies have indicated that nonoperative treatment, featuring physical therapy and medication, usually relieves the symptoms for frozen shoulder. The evidence suggests that few additional benefits are achieved by undergoing physiotherapeutic procedures like bipolar interferential electrotherapy, pulsed sonography and magnetotherapy. One study found that a four-direction shoulder-exercise program produces significant results for most patients, though people with severe pain or extreme loss of motion often require surgical techniques such as manipulation or capsular release. While nonsteroidal anti-inflammatory drugs succeed in reducing pain and inflammation, they have not been shown to improve range of motion unless patients take the medication while engaged in stretching exercise programs. Intra-articular corticosteroid injections relieve many patients’ symptoms. However, according to one study, more than two-thirds of injections that are done without radiologic guidance fail to deliver the steroids to the glenohumeral joint. Researchers reported that a posterior injection method reduces pain and improves the shoulder’s rotational mobility in more than 80 percent of cases. Short-term abatement of symptoms, lasting one to three months, has been reported in patients treated with intra-articular joint distention or brisement. However, long-term outcomes are about the same as those achieved by other types of treatment. Closed manipulation usually succeeds in restoring motion. However, it occasionally causes fractures in the humeral shaft. The technique’s value is limited, in that it does not provide controlled release of pathologic tissue. Some patients report no improvements, or decreased comfort and range of motion, after receiving manipulation. People with rotator cuff tears, as well as diabetes sufferers who are long-time insulin users, are among those who benefit least from the treatment. One study suggested that patients respond better to manipulation if they have been experiencing symptoms for more than six months. Research results vary widely, with between 25 and 90 percent of patients improving within three months after receiving the treatment. An average of 70 percent reported less pain and more flexibility six months following manipulation. In another clinical trial, 94 percent of manipulation patients were satisfied with the outcomes, though about 13 percent continued to report some degree of disability. Research has determined that arthroscopic release, the surgical procedure most often employed to treat frozen shoulder, is safe and effective. It improves range of motion, and patients feel little postoperative pain. People who suffer shoulder stiffness as a result of surgery or injury are among those for whom arthroscopic release is recommended. However, the method is controversial. Some experts say its diagnostic and therapeutic value is limited. A program of aggressive passive or active exercises can be initiated soon after the surgery. In rare cases, patients suffer recurring stiffness, anterior dislocation or nerve palsy. Some of the best results have occurred when patients receive manipulation following arthroscopic release.